At Green Air, we’re all about meeting and exceeding the expectations of our customers. Our huge success in building a name for ourselves in the realm of HVAC services is driven by our commitment to constantly innovate and improve on what we’ve got to offer. It is our mission to provide our customers quality HVAC services that combine functionality and innovation in one neat package, making us THE go-to East Bay HVAC professionals — delivering on exactly what you need, exactly when you need it. Green Air strives to be a relevant solutions provider not just for HVAC, but for solar and Certainteed-certified roofing as well. We work hard to equip each employee—from our salespeople to our HVAC and roofing technicians—with the tools they need to deliver the stellar service our business is known for. 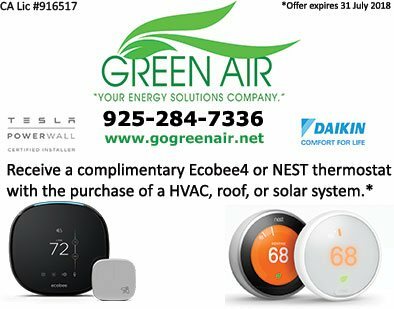 At Green Air, we make it our goal to a have our customers experience the difference in our products and services first-hand, and to have them coming back for more of the superior green and energy-efficient solutions we offer. At Green Air, we’re not much about profit, but more about meeting East Bay homeowners’ expectations — we take pride in the high-quality service and products we’re known for, and don’t consider the job done until our customers say so. Applying every lesson we’ve learned from our years of service, we aim to build lasting relationships and become your primary HVAC and roofing solutions provider of choice. We refuse to have it any other way. Green Air works hard to assist you in creating the most efficient systems for your home. 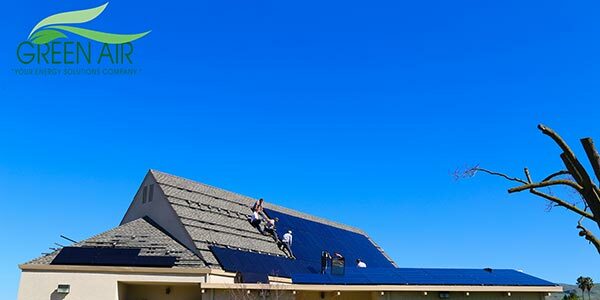 Dial (925) 62-SOLAR or (925) 28-GREEN, or complete our contact form to reach us today!